L.J. 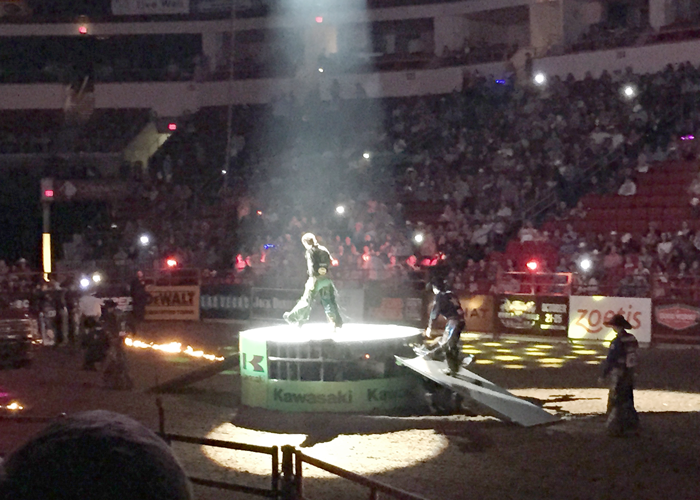 Jenkins is one of the top 35 bull riders in the world. 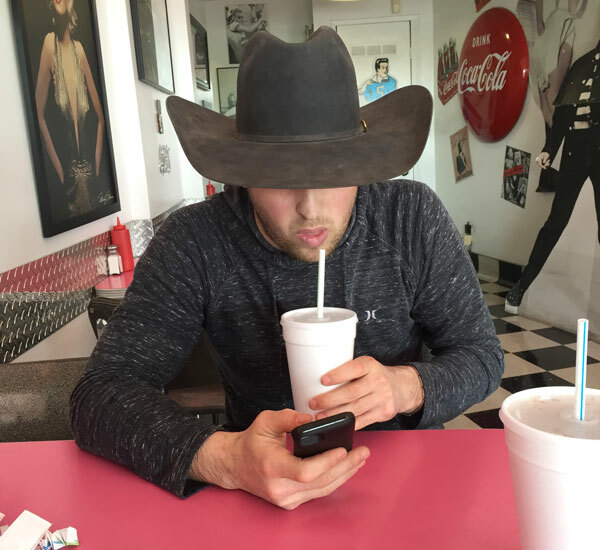 As a competitor on the Professional Bull Riders (PBR) circuit, the 27-year-old travels all over the country riding at various events. 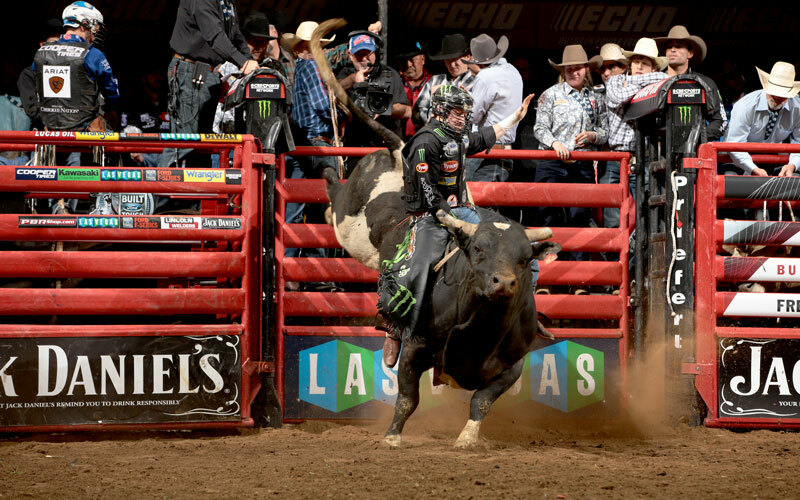 The season lasts from January to May and then picks up again from August through October, when the PBR holds its World Finals. During these times, Jenkins is traveling and riding almost every weekend. It’s a grueling schedule that leaves him with little time to sleep, but he loves what he does. Now on his eleventh tour, Jenkins has made some $1.7 million riding bulls at PBR events. He has also earned additional money from sponsorships. His goal: Have enough money to retire by age 30. “I would probably keep going, but I don’t want to be a guy that’s broke up and can’t get out of bed at 50,” he said. Woke up early and packed the car for the drive to Oklahoma City to catch our flight. We left our house in Porum, Oklahoma at 3:30 to get us to the airport in time to check in at 5:50 a.m.
I’m pretty tired and eager to catch a few more zzzz’s. We always take the earliest flight possible so I can rest as much as I can before the event. 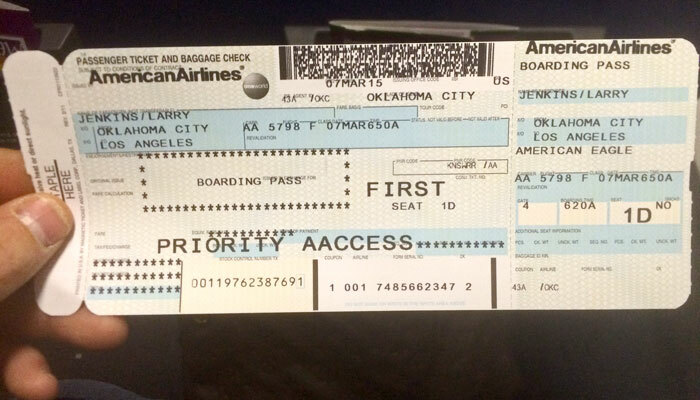 We park our vehicle, check in and get on the first flight, which will take us to L.A. for a short layover. 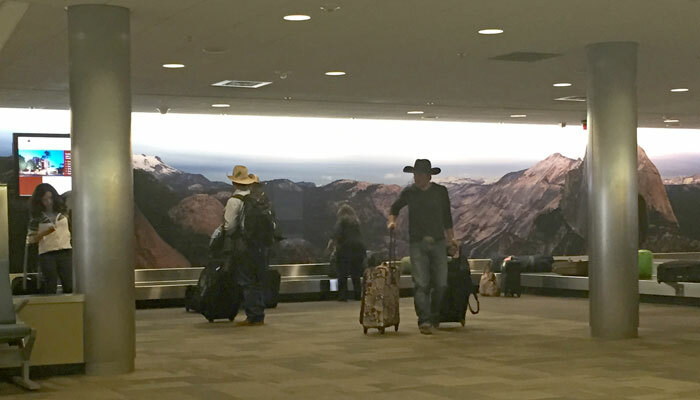 We arrive at LAX and see that there are several other members of Professional Bull Riders already there. We see PBR doctor Tandy Freeman, bullfighter Frank Newsom, and fellow bull rider J.W. Harris all waiting for the flight to Fresno. During the event season, L.J. is constantly on the road. We land in Fresno, get our bags and rental car. I drive J.W. and Frank to the Holiday Inn to check in and then my fiancée, Christen, and I go to lunch at a local restaurant, Fat Jack's. It’s not very healthy, but we sometimes don’t eat very healthy. Of course, we have milkshakes to finish off our meal. We head to the hotel. Our room wasn't ready but we discover that a couple other riders have made it in so we meet up with Sean Willingham, Stormy Wing and Kasey Hayes and hang out with them. We finally get into our room and I immediately lay down to take a nap. I get up to take a shower and get ready to leave for the arena. I’m pretty relaxed and excited for the event. I know the first bull I’ll be getting on is Bar 3d's Springsteen. I know a little about this bull, it goes around to the left, which isn't my strong side but I am still feeling good about the night. We get in the rental car and head to the Save Mart Center. I like to arrive at least an hour and a half to two hours before the event to get settled and get in the right frame of mind for the night. Being there early gets my head out of the real world and focused on the bull world. In the locker room ahead of the event. I usually like to go behind the chutes and check out the bulls for the night, especially the one I’m getting on. Bar 3d Springsteen is a black bull with white patches on its back legs. I had a sponsor obligation with Wrangler so I head up to the concourse to sign autographs and meet with fans. Even though I’ve been doing this for years, sometimes I can still get shy in front of the fans. I’m not real big on attention but I do love to meet the people who support my career and the PBR. My favorite part of signings like this is when young kids come to see me. I love kids and I like talking to them about the PBR and riding bulls. I head back down to get my things ready for the event and get dressed for the intros that happen at 7:00. I’m starting to get a little nervous but it’s still exciting and I’m ready for the event to start. The event begins. I’m usually pretty anxious all the way up until I get on my bull. Even though I’ve been doing this every weekend for the last 10 years, the pressure is always there. Unfortunately, it’s not a great night for me. The bull got the best of me and I only lasted three seconds (it takes eight seconds to qualify). But I know I need to not dwell on it and just prepare for the next night and the next bull. Being around my fellow riders after a ride or a buck off always helps me put things in perspective. 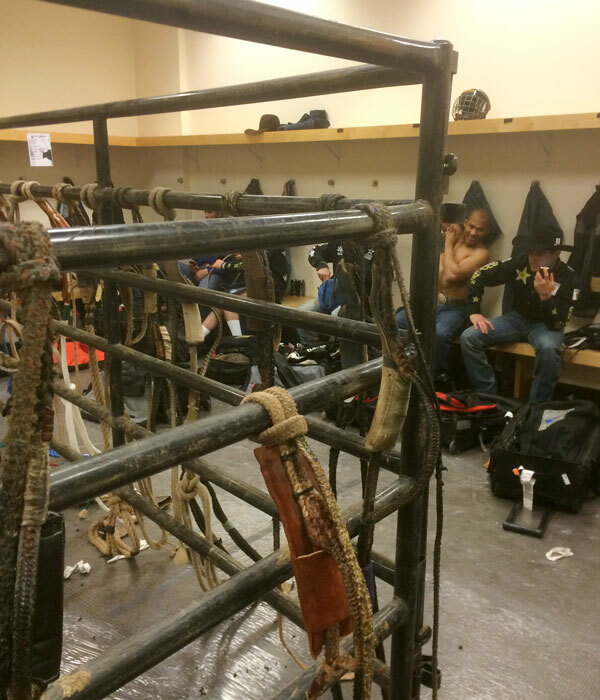 There’s a lot of camaraderie with us bull riders, we know that we’re not riding against each other, it’s us against the bull. 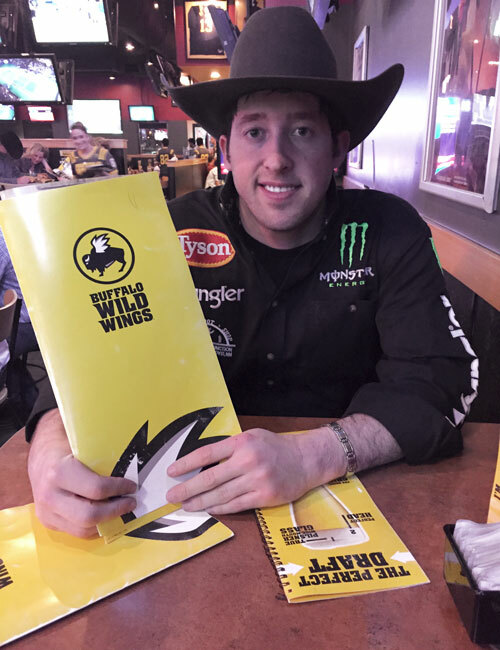 We decide to head across the street to Buffalo Wild Wings with my fiancée and some fellow bull riders. Not a big night because we all need to get ready for the event the next day. Plus it’s been a long day with all the traveling. Tomorrow is another day and another bull for me to ride.